We poled our expert piano teachers to get definitive answers to the most frequently asked questions about piano lessons and practice. Whether you are a beginner or a self-taught genius, these questions and answers have important takeaways for everyone. I Didn’t Take Music Lessons as a Child, Is It Going to Be Harder for Me as an Adult? Children who take music lessons as a child are naturally in a better position to continue piano lessons as adults. These music lessons carve neural pathways that make future learning easier. However, non-musically trained people are not as disadvantaged as one might think as the brain is always ready to learn new things and build new neural pathways at any age. Why Do Children Learn Music Faster than Adults? In all reality, this is a perception created by the amount of time dedicated to practice and the passion with which the student is pursuing music. Naturally, children have less busy lives than adults and can devote more time to the music. Plus, their parents often set daily practice schedules. Adults tend to excuse themselves from practicing when their day gets too busy. It is true that children are often quite eager learners with sponge-like brains that absorb new information quickly. However, plenty of adults skip through their lessons quicker than their youthful counterparts with focus and daily practice. Adults have more ability to understand the complexity and coordination involved in playing piano, whereas kids have to take baby steps – no pun intended. Should I Take Piano Lessons so I Can Play Guitar Later? Although it can help a little, piano is not a necessary stepping stone to another instrument. The music theory and playing technique of these different instruments are different. The piano can help beginners grasp chord theory and scales easier because with a piano, playing scales is more logical and progressive and so are chords, as compared to a guitar or other instrument. Even so, if you learn music theory on a piano then you will still have to learn how to apply it to guitar. Piano does not make you automatically better on a guitar, bass, or any other instrument. Do I Have to Study Classical Music First? What If I Want to Play Pop, Rock, or Blues? If you think about the complexities of Fur Elise versus the piano music of Hey Jude, you might conclude the obvious – Fur Elise is a more intricate piece of music, despite being written for students. Contrary to popular belief, classical is not a foundation of music that other styles are built upon. In reality, pop and rock patterns are more straightforward to learn because they are based on simple chord progressions. If your teacher is proficient in your preferred genre and he/she incorporates important bedrock elements like music theory into your piano lessons, then you will rise to the top of your genre just as easily as if you had classical training. I Have Short, Thick Fingers. Can I Still Play Piano? There are no wrong finger types for the piano, despite what you’ve undoubtedly heard. Even long slender fingers aren’t necessarily the best option. Stronger, tapered fingers are more able to fit between the black keys while still having the strength to strike the keys with the right force. In reality though, you will learn how to play piano in a way that works with your hand size, finger length, thickness, and strength during your lessons. If little kids can play piano, there is no reason an adult with shorter fingers can’t. Do I Need to Practice Every Day? I Have Work, Kids, School, Etc. When you’re not at the piano or in lessons, your subconscious is processing everything you’ve been working on in class and at the keys. This is an important part of the learning process and enhances your playing and productivity during practice. In may instances, it may not be practical to practice every day. If you can, aim for five days per week. 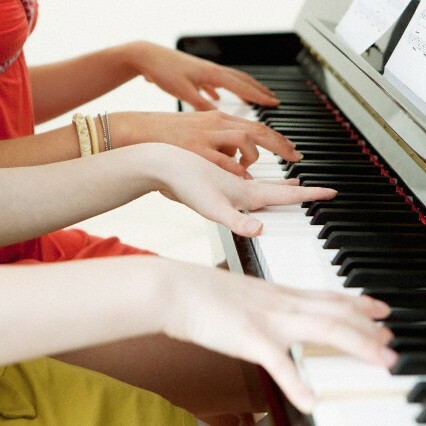 Many piano teachers tell their students to practice for thirty minutes per day. Some students are not able to sustain productive practice for that amount of time. If this sounds like you, start with fifteen minutes and see how you do. If you can work up to thirty minutes without feeling frazzled, then go for it. If you have a short attention span, work on five to ten minute increments totaling fifteen to thirty minutes per day. Overall, aim for 100 minutes per week at the piano. Will I Forget Everything If I Take Time Away from My Lessons? You won’t lose it all, but you might fall back a little. Breaks are necessary to prevent burn out and stimulate creative growth. In order to progress in anything, we often need to take periodic breaks. This is why we have paid vacations from work; it enhances our productivity. You might back slide a little if you take a sustained period of time off from piano, especially if you are fairly new to lessons. We recommend discussing with your teacher the best way to take a break without forgetting everything. It might be less frequent practice or a break from lessons with increased practice or something altogether different. What Finger Training Drills Should I Use to Warm-Up? The only finger warm-up that you really need is playing music. Start your practice with the most challenging aspect of your current song. In the beginning of your practice, your mind is fresh and ready for challenges. This will enhance your dexterity and warm your fingers up quite quickly. I’m a Beginner, Why Doesn’t My Teacher Have Me Lift My Fingers Really High off the Notes? This is an old technique used in lessons that only trains unnecessary bad habits. Teachers used to have their students raise their fingers very high off the keys to exaggerate the idea of precise finger placement and pressure. Unfortunately, this often trains the exaggeration into the student’s playing practice and is a hard habit to break. Instead, we teach students to simply rest their fingers on the key when they are not playing that note. Don’t I Need to Learn Finger Techniques Before I Learn a Song? Not necessarily. Finger technique is no more important than learning music theory, notation and musical expression. It is best to learn all of these elements in the same way that they will be used during your playing: all together. You will learn plenty about finger technique by playing various repertoire. Why Do I Need to Keep Practicing My Hands Separately? Even when you play your hands together, your hands are doing different things individually. Most musicians will acknowledge that one hand is “stronger” than the other; it is necessary to continue to work each hand to keep them as equal as possible. Working one hand at a time allows you to focus on the music you are playing with that hand, iron out any issues, pick apart nuances or tricky spots and master the section. Once you’ve done this with both hands, the music will sound worlds better when you bring the hands back together. Why Do I Have to Keep Reading Finger Numbers? I Thought I Was Past That. Finger numbers act as a guidepost for more complex arrangements. They help prevent you from spending your time and mental energy trying to figure out busy patterns and allow you to get through the passage efficiently and smoothly. You will often see a few finger numbers written into pieces like this. For the rest of the notes, the finger positions are implied because, as you astutely pointed out, you are past that. Even professionals rely on finger numbers written into complicated works such as these, whether written by the composer or arranger. In fact, many professionals create their own personalized finger numbers based on their hand size or preference, and they will write their own numbers into the composition. Can I Write in the Sheet Music? Speaking of writing numbers in the composition, we get this question a lot. Unlike grade school, you can absolutely write in your music books. Dedicated musicians of all stripes write on their sheet music and there is nothing wrong with this, as long as you do not use it as a crutch to avoid learning how to read music. You might need to make some notes to help you through tricky spots, add finger numbers, circle troublesome sections or name certain notes to help you get through the song easier. In fact, writing into the sheet music can help enhance your ability to read notes, decipher the best finger patterns and become a better musician. Should I Avoid Looking at My Hands on Piano? No. You can and should look at your hands, especially as a beginner. The trick is to find balance between looking at your hands and learning where they go by muscle memory, which you will work on during lessons. There are times when it is absolutely necessary and appropriate to watch your hands, and times where you will need to be reading the music or looking ahead. Develop an understanding of when watching your hands is helpful and when it is a hindrance. Don’t I Have to Read Ahead on My Sheet Music? One important lesson in music training is reading ahead. When you can play notes on a piano without relying on your eyes to tell you where the note is, you can start working on this. Without that building block, you will lose your place in the music. This takes time to learn and master, as does sight-reading. When Can I Start Improvising? Improvisation is a creative tool that you should begin as early as possible. Many teachers will not incorporate it into your lessons until you have a good grasp of the fundamentals. Even if you’re just playing around at home with what you learned in your last lesson, it is essential to the creative development to explore the possibilities within the parameters you’ve been given so far. This helps you build your technique and expand your understanding of music so that as you better understand theory you are more able to improvise. Ad-libbing music is not solely intellectual and rooted in theory, it is also about feeling the music and being brave enough to run with your ideas. What is the Best Way to Learn New Music? Learn it in the way that makes the most sense for you. Some people will tell you to work on the difficult sections first, while your mind is fresh. Others will suggest working on it from front to back or one hand at a time. Each of these methods has merits. Knowing what works for you is one of the most important lessons you will learn. Your teacher should help you identify your learning strengths so you can figure out which method would work best for you. How Fast Should I Practice New Songs? When you are learning a new song, you want to go slow to keep the right pace throughout the song while learning each piece. If you have one section down really well and rush through it only to slow down while you pick through the next section, you will likely build that “rush/slow” concept into the song when it isn’t written that way. Once you have the whole song down, speed it up to normal. Once you can play it well at normal time, challenge yourself to play it even faster. Learning how to play a song faster than it actually goes will make playing it at normal time even easier. Can I work on More than One Song at a Time? Absolutely. Most professionals are working on fifteen to twenty pieces at any given moment. It would be a boring concert if they only played one or two songs, right? In your lessons you will be working on one or two different arrangements, maybe more. You can still explore other songs at home by sight-reading. You can also maintain proficiency with songs you’ve already mastered. As you progress and gain confidence, feel free to add more songs to your repertoire. It’s never too late to learn Alberto. All you need is the time and dedication. Give us a call at 416-406-5355 and let’s find you a teacher that fits best with your needs!